I've grown weary of the blog posts and forum rants stating why one programming language is better than another. I don't mind when languages are compared to help see how they are different or even when one language is argued as better for a very specific situation for a specific reason. I have yet to find (and never expect to find) a programming language that is better than all other languages for all situations (and this includes HTML5). In fact, I have found the contrary to be true: although I definitely have my favorite handful of programming languages, I recognize that a much wider spectrum of programming languages (even some that I don't personally like) have helped software development as a practice arrive where we are today. In this blog post, I look at the contributions of several different programming languages to our discipline. In most cases, the listed language was not the very first to introduce the concept or feature, but was the first to make it popular or "mainstream." The purpose of this post is NOT to state which programming language is best or why one is the best thing since sliced bread while another is the worse thing to ever happen to a software developer. I also don't cover markup "languages" such as XML or HTML in this post, though they obviously have had significant influence on software development. Most software developers I know have written some code in some form of BASIC (Beginner's All Purpose Symbolic Instruction Code). I remember, long before public availability of the Internet or even mice on PCs, typing in Basic code from magazines I received in the mail with code listings for various simple games and PC utilities. Like many developers, Basic was the language that attracted my interest at a relatively young age to programming. It was from my Basic programming that I learned firsthand the dangers of the goto. C may be the most influential of all programming languages on today's software development. In Steve Yegge's well-known blog post The Next Big Language, Yegge's #1 rule for the next big programming language is that it has "C-like syntax." Many people's favorite programming languages are themselves (interpreter or runtime environment) written in C and many of these languages provide mechanisms (JNI and XS are two examples) for "escaping" to C for performance gains. C also remains one of the most popular and highly used programming languages in the world despite its relatively old age. Wikipedia even has an entry devoted to C-based programming languages. I believe that the spirit of Smithsonian’s Cobol debut is not an indication of its antiquity, but rather a testament to its past, as well as its continued success. Just as Edison’s light bulb was a game-changing invention in its day, Cobol has changed the face of computing, and continues to have a tremendous impact on our everyday lives. John Breeden II also writes of Cobol's impact on software development in A toast to Cobol, a true computing hero, stating, "Without Cobol, each early computer might have developed its own proprietary computing language. Instead, we started on a path to interoperability that would come in very handy later on." C#'s status as flagship language of Microsoft's .NET has made it influential out of the box. C#'s syntax and early features also paid homage to and provided evidence of the influence of C, C++, and Java. Although C# borrowed heavily from those languages in its early versions, it also brought its own advancements that were emulated by other languages (in particular by Java). It was Microsoft's plan for migrating legacy Visual Basic applications to the .NET framework (and making use of C# libraries) that demonstrated on a large scale the advantages that the JVM already offered but were rarely used. The multiple language paradigm on the JVM has become huge in recent years, but Microsoft's use of the CLR seemed to be the first to bring this idea to mainstream awareness even though the JVM existed before the CLR. C++ was the object-oriented language for a while, is still heavily used, and has inspired other highly popular object-oriented languages such as C# and Java. C++ has dominated the "system programming" market and changed how many of us think about programming from completely procedural to object-oriented thinking. C++'s direct influence as a popular language in its own right and indirect influence via "child" languages that have reached their own popularity heights are proof of this language's dramatic influence on software development. The IBM article Fortran: The Pioneering Programming Language states that Fortran (FORMula TRANslator) "became the first computer language standard, 'helped open the door to modern computing,' and may well be the most influential software product in history." This is an interesting read that I highly recommend for learning more about Fortran's impact and influence on software development. Fortran has also been called "the first successful high level programming language." Along with Lisp, one of the first programming languages many of us think of when discussing functional programming is Haskell. As languages such as Scala, Clojure, and even Java 8 bring functional programming concepts to the JVM, it's not difficult to see the roots of these features in languages such as Haskell and Lisp. The Why Haskell matters Wiki page states, "Haskell is a modern general purpose language developed to incorporate the collective wisdom of the functional programming community into one elegant, powerful and general language." There's even a free online book called Learn You a Haskell for Great Good! David Chisnall calls Lisp "arguably the most influential programming language of all time" in his post Influential Programming Languages, Part 4: Lisp. Reasons he cites to justify this claim include Lisp being "the very first programming language to provide automatic garbage collection," Lisp's introducing "the idea of the read-evaluate-print loop (REPL)," Lisp's early use of closures/lambdas, and Lisp's "inspiration for pure functional languages" and "inspiration for a number of object-oriented languages." In Why Lisp?, Peter Seibel states, "So, on one hand, Lisp is one of computer science's "classical" languages, based on ideas that have stood the test of time. On the other, it's a thoroughly modern, general-purpose language whose design reflects a deeply pragmatic approach to solving real problems as efficiently and robustly as possible." Like Basic, Pascal is influential on software development because of its wide use as a "learning language." Aspects of Pascal are also seen in other languages. For example, the Oracle database procedural programming language PL/SQL has always felt eerily similar to Pascal. One might argue that Pascal's influence is felt more today indirectly via languages such as PL/SQL than via direct use. On a personal note, Pascal is the first language that I used in more than hobbyist fashion (that was Basic's role for me) as I had high school and college courses that used Pascal and I wrote my first "commercial" application (a sports trading card inventory control system) in Pascal. I still think Pascal offers numerous advantages as a "learning language." Perl has been a significant contributor in a wide variety of contexts, especially in early web development (CGI scripts) and in Unix/Linux scripting and development. Perl was often the first taste of a dynamic language for C-style language developers. It also helped many developers to realize the advantage of writing scripts in a language that could be used in all shells rather than using shell-specific scripts. Furthermore, it can be argued that Perl, perhaps more than any other language, has brought the power of regular expressions to the forefront of software development along with some powerful and concise features of sed and awk. I have no evidence to back this, but it feels to me like Python is the language taking most developers away from using Perl for scripting. There are still countless scripts written in Perl and still be written in Perl, but Python seems to be gaining on the percentage of new scripts being written. There are Python libraries for all types of different domains. For example, in my post Significant Software Development Developments of 2013, I wrote about Python and Big Data. Python seems to appeal to a wide variety of developers in the Java, .NET, C/C++, and other development communities where Python is not the predominant language. Although Ruby on Rails is a framework rather than a language, it is Ruby on Rails that seems to have made Ruby famous outside of Japan and so it's difficult to talk about Ruby's influence without considering Ruby on Rails's influence. Ruby has popularized many object-oriented concepts that were available in other languages that never reached Ruby's level of adoption. Ruby's treatment of everything as an object (no primitives) and its powerful use of dynamic mechanisms in conjunction with object-oriented principles made combined object-oriented structure with a dynamic language in ways that Perl's bolted-on object-orientation could not achieve. Ruby on Rails popularized the concept of configuration by exception that is prevalent today, but was lesser known (Maven, Hibernate, and JavaBeans for example) before Ruby on Rails and the specific and catchy nomenclature of "convention over configuration." If we were to measure programming languages by the ratio of influence on other languages and frameworks to existing code base written in that language, Smalltalk might have the highest ratio of them all (though ALGOL would give it a run for its money in terms of code still deployed today). For its relatively small deployed code base, Smalltalk has had tremendous influence of frameworks and much more widely used programming languages (including Java and other object-oriented languages). Smalltalk has influenced other languages' syntax and concepts (such as everything is an object) and has had obvious influence of today's IDEs. I won't talk much about Visual Basic here because I've already touched on it at least tangentially in the Basic and C# coverage, but it has been one of the world's most popular programming languages at one time and influenced many developers who got their hobbyist and professional starts with that language. It has also influenced software development through early IDE innovations that provided a glimpse of what Java and other programming language IDEs could (and would) become. The languages described in this section are descriptions I have added since the post was originally published. Nicolas Frankel's (@nicolas_frankel and current DZone Dev of the Week) Tweet reminded me I had forgotten to include Java on my list (despite Java having the most personal influence on me of all the programming languages). I rectify that here with the paragraphs I intended to include in the original post. Given Java's ubiquity in academic and professional programming environments, numerous developers have written Java at one time or another and the sheer number of developers exposed to Java conveys its impact on software development in general. Many new language designers still compare and contrast their languages to Java. Perhaps Java's biggest influence on programming was its introduction of the JVM and the many benefits associated with a virtual machine. The JVM allowed for better support than most languages had been able to provide for the "write once run anywhere" paradigm. Not only did this increase the ease of portability of Java applications, but it helped many of us start to think that maybe it is best to have data types have the same memory size regardless of the platform for which the application is written. Java's garbage collection mechanism was an almost-too-good-to-be-true feature for those of us who had primarily been using languages that required developers to carefully manage their own memory deallocation. The ability to manipulate Java byte code after compilation has led to numerous JVM-based dynamic languages and was one of the reasons that aspect-oriented programming was arguably best implemented in Java-based products such as AspectJ and the Spring Framework. One of the first things that impressed me about Java was the Javadoc mechanism. I loved being able to include in-source comments that were generated into documentation viewable in a web browser. As internet use grew, the availability of the standard JDK API, Java EE API, and libraries' and frameworks' APIs online was a huge benefit and many other languages have since emulated this feature. I had never considered the power of reflection or introspection until using Java. Java continues to add reflection capabilities such as method handles in Java 7 and the new java.lang.reflect.Parameter class in Java 8. The ability to programmtically access details about the internals of the virtual machine and even of running applications themselves was a concept introduced to me by Java's Java Management Extensions (JMX). Java's emergence occurred in the era of we C++ developers (among others) grasping concepts covered in the Gang of Four's book Design Patterns: Elements of Reusable Object-Oriented Software. Java introduced features built into the language that formalized some of this book's concepts for us. In particular, the Java interface makes implementing many of the patterns outlined in that book easier. Java also included features that have led developers to make decisions about coding based on practical experience rather than simply theory. The best example I can think of is Java's introduction of checked exceptions. Whether loved or hated, Java's implementation of checked exceptions and unchecked exceptions has helped many developers to form opinions based on actual experience on those concepts. 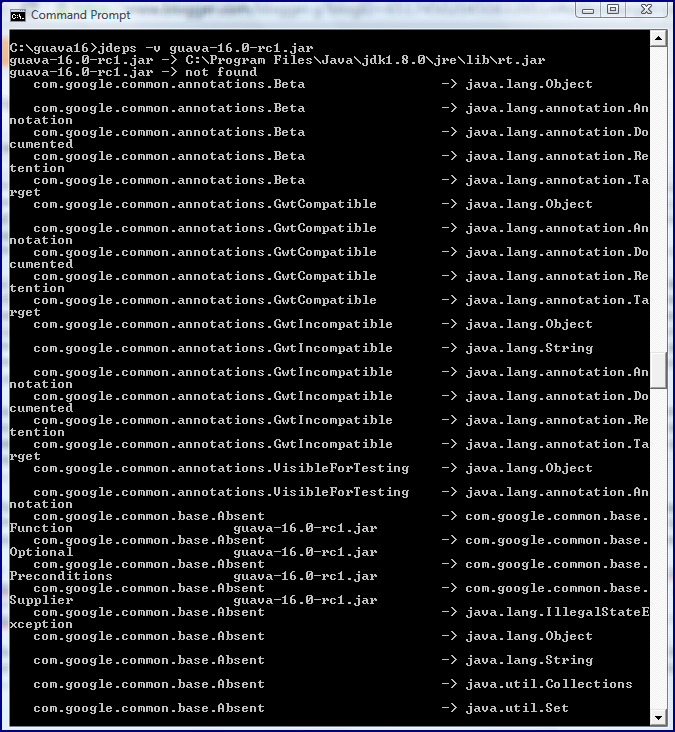 Thanks goes to Nathan Green and Valery Silaev for also pointing out that I neglected to mention Java. Valery emphasized the same VM advantages Java touted and emphasized trust and performance gains in a virtual machine environment. Nathan had the same thought of me about the virtues of documentation generation from source code that Java made mainstream with Javadoc. Nathan also points out that the JVM supported some (minor in my opinion) languages before .NET was born. I maintain that .NET's (forced out of necessity but, as Nathan points out, not entirely successful) support of one of the world's most widely used languages (Visual Basic) being able to call libraries written in the new hotness (C#) was what really helped us to see what was practical and commercially viable on large programs. I'm not going to single out languages other than Java that run in the JVM in this post, but they are unquestionably influencing software development, particularly among existing Java developers. Groovy has helped me to embrace my inner scripter and Scala has helped me see more clearly the dangers of mutable state and the value of functional programming. Clojure, Kotlin, and Ceylon are also challenging the ways Java developers think and introducing new concepts, some of which even make it into Java itself. These alternate JVM languages bring many of the concepts and influences of non-Java languages (Ruby, Lisp, Erlang, etc.) to the Java developer without leaving the comfort of the JVM. The best examples of this last point are JRuby (for Ruby) and Jython (for Python). In my post Why PHP Will Be My Next Language, I wrote about some of the reasons I was giving PHP another chance after really not liking what I saw when I first looked at it in the late 1990s. In many ways, I think that same post is a reflection of how PHP has been positively impacted by developers' experiences with other languages and cultures. There is no doubt that PHP has had a huge impact on web development. PHP has been a "gateway language" for many new web developers. It's easy mixing of presentation and server side logic has irritated some of us, but been seen as an advantage to others. It has reminded me that no rules in software development are absolute. Numerous major web platforms are built on PHP and provide PHP APIs. The ubiquity of these necessarily means that developers cannot help but use and be influenced by PHP as they write for these platforms. It is interesting to me that the web page Past programming languages and their influences on today's languages and programming paradigms is powered by PHP even though PHP is not mentioned specifically in the article. It sounds something like a Java-oriented blog not featuring Java as one of its languages that has contributed to software development. Thanks goes to Valery Silaev for mentioning my neglect of PHP in this original post. The recent interview article "Security is one of the biggest problems for the IoT right now" reminded me that I missed Ada on my list. Although Ada today fits Jamie Ayre's description in that article ("[Ada]’s certainly a niche language, it’s not C, it’s not Java". ), Ada was much bigger historically and has had tremendous impact on software development. AdaCore's description of Ada states, Ada is a modern programming language designed for large, long-lived applications – and embedded systems in particular – where reliability and efficiency are essential. ... Ada 95 was the first internationally standardized (ISO) Object-Oriented Language." Erlang is described on its main web page as "a programming language used to build massively scalable soft real-time systems with requirements on high availability." The Don't Drink Too Much Kool-Aid section of Learn Us Some Elang for Great Good! does a nice job of contrasting what Erlang is good for with what it's not as good for. Erlang's concurrency-oriented models have influenced developers and other languages. Why Erlang Matters and Why I Program in Erlang are also interesting reads about Erlang and its influence on developers. Software developers today have more programming languages to choose from than ever before. No one language is best in every situation and the variety of languages with different sets of advantages and disadvantages provides the consumer (developers) with many choices. Competition is good for the consumer and has driven improvements in the languages we use. One of the advantages of working with different programming languages is the ability to learn paradigms and concepts that can be applied to some degree in the work we do even with other programming languages. Although I definitely prefer some languages over others, I recognize that all major programming languages have their faults (or situations they aren't the best fit for) and all major programming languages have their advantages (or situations where they are one of the best fits for). I undoubtedly missed several important programming languages in this post and also undoubtedly missed several important features of some of the covered languages that have impacted software development in general. Feedback adding these languages or language features is greatly appreciated. I recently started working with LaTeX based on a colleague's recommendation. To be honest, it was a little steeper learning curve installing it and initially learning it than I've become used to when installing and using new software development products and I hope in this post to provide some basic tips to help others who want to investigate this "document preparation system." The main LaTeX project page describes it as "a high-quality typesetting system" that "is designed for the production of technical and scientific documentation." An introduction to LaTeX helps to understand what LaTeX is at a high-level and is probably the best place to start when trying to determine whether to invest more time in learning LaTeX. 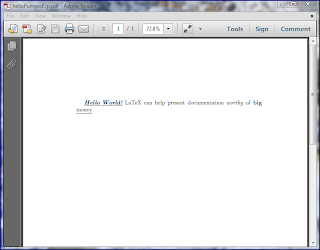 This page emphasizes that LaTeX is "not a word processor!" This page provides a simple example to demonstrate a driving principle of LaTex: "LaTeX is based on the idea that it is better to leave document design to document designers, and to let authors get on with writing documents." Mike Unwalla's LaTeX: an introduction is a single-page PDF that also introduces LaTeX and provides another simple example of LaTeX code with the corresponding output. This article emphasizes how to pronounce LaTeX (it's NOT pronounced like the the rubber product latex that might dominate an initial Google search for this term). A person interested in LaTeX after reading An introduction to LaTeX and LaTex: an introduction might want to next see the ubiquitous Hello World example so familiar to software developers applied to LaTeX. The best resource for this is the initial tutorial in Andrew Roberts's excellent series Getting to Grips with LaTeX. 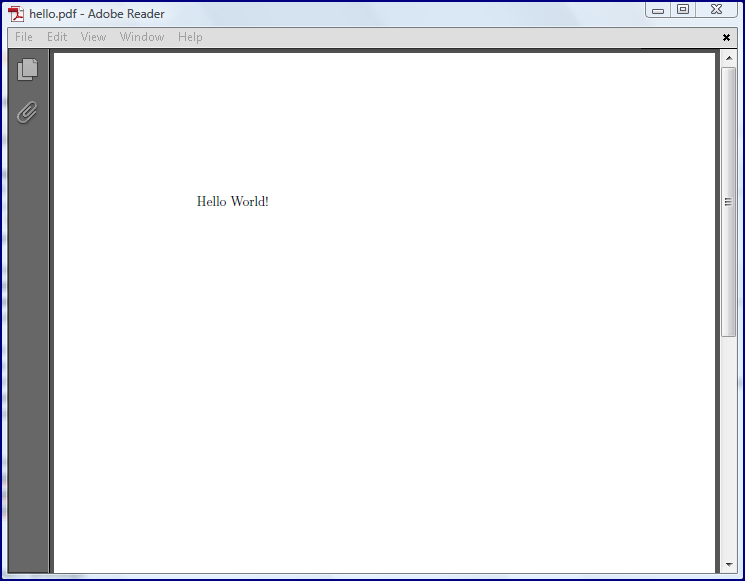 Tutorial #1 in the Getting to Grips with LaTeX tutorial series is called Absolute Beginners and provides a bare-bones Hello World example in LaTeX. At this point, the person investigating LaTeX probably wants to try it out. The main LaTeX project page references the Obtaining LaTeX page for information on acquiring LaTeX. My recommendation for LaTeX first-timers is to download the appropriate distribution for their operating system from the top "LaTeX for the impatient" section of this page. In this post, I'll talk more about downloading and installing proTeXt for Windows. proTeXt can be downloaded from the proTeXt - MiKTeX-based distribution for Windows page. This page states that "proTeXt aims to be an easy-to-install TeX distribution for Windows, based on MiKTeX" (Joseph Wright compares MiKTeX to TEX Live in TEX on Windows: MiKTEX or TEX Live?). The page warns that this file is large (well over 1 GB in size). Once this large download is complete, click on the setup.exe file that appears as part of the download. 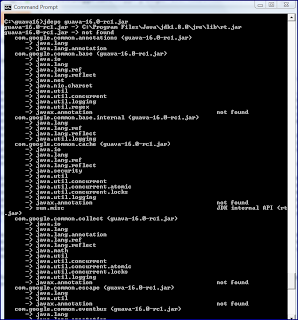 That will lead to the appropriate extraction of proTeXt into a specified directory. At that point, click on the protext.exe file to install proTeXt. Clicking on (running) protext.exe brings up an installation pop-up that allows you to click buttons to install MiKTeX (version 2.9 currently) and TeXstudio (version 2.5.2 currently). 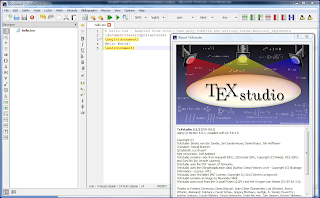 MiKTeX is large and its installation takes a considerable amount of time while the much smaller TeXstudio installs very quickly. 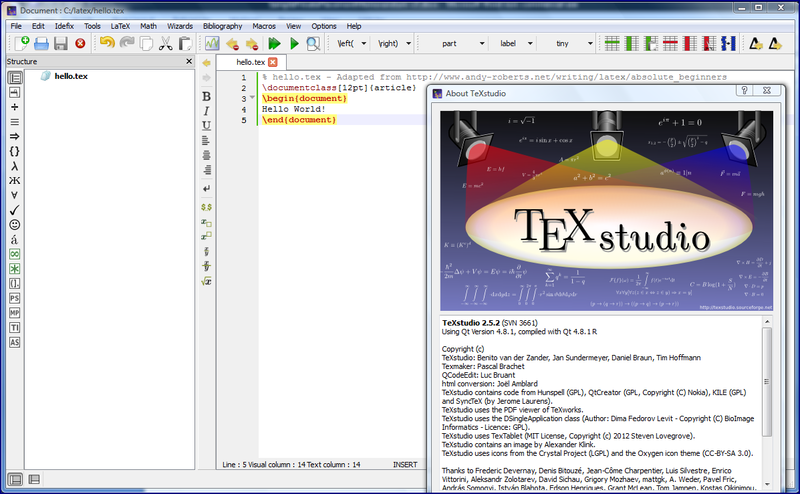 With MiKTeX and TeXstudio installed, we are ready to try a LaTeX example out. 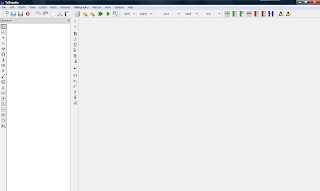 To do this, I will run TeXstudio in Windows. 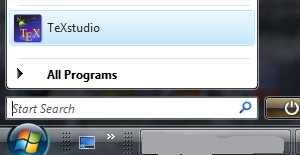 The next two screen snapshots show this in two different ways (one from selecting from "All Programs" and one from selecting it after it's been used and is pinned to the Startup Menu). 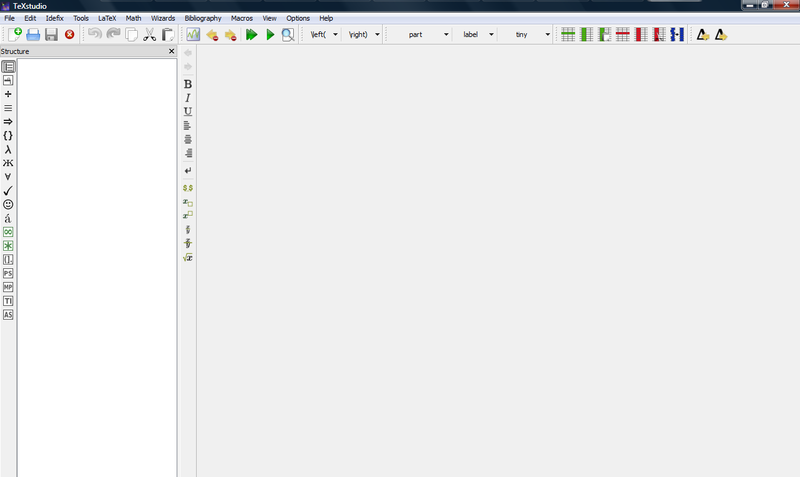 Once I have started up TeXstudio, I will see something like that shown in the next screen snapshot. At this point, we have specified the content of our file and now need to convert it to the presentation format of our choice. 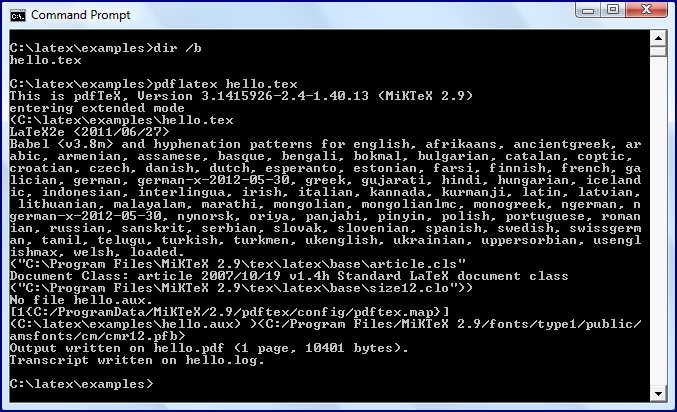 In this case, I am going to use the downloaded MiKTeX to convert this hello.tex file to a PDF. I do this by opening a DOS command prompt and navigating to the directory where I told TeXstudio to save the hello.tex file (C:\latex\examples in this case). The next screen snapshot shows that file in that location. At this point, I want to run the MiKTeX tools against this file. 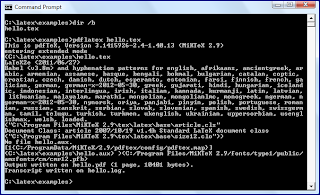 I can verify that the MiKTeX installation has placed MiKTeX in my path on Windows by typing echo %PATH% and looking for something like "C:\Program Files\MiKTeX 2.9\miktex\bin\" in the output. That directory has numerous executable (.exe) files including pdflatex.exe which I am going to use her to generate a PDF from hello.tex. 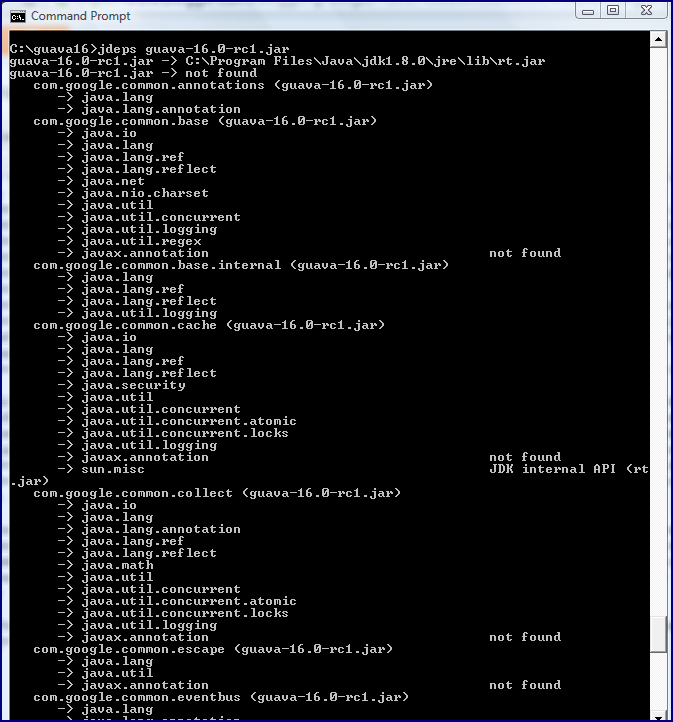 This is demonstrated in the next screen snapshots which show the command-line generation process and a snapshot of the resultant PDF. The next screen snapshot indicates that we now have four files in the directory in which the hello.tex file was the original sole occupant. The new three files are the PDF output file just shown, a text-based log file, and a text-based .aux file. With the appropriate LaTeX distribution downloaded, a useful LaTeX editor with code completion and color syntax available, and the ability to run the LaTeX distribution executables against generated LaTeX source code, one can now start to experiment with the numerous commands that LaTeX supports. There are numerous listings and "cheat sheets" for these numerous commands, including Scott Pakin's The Comprehensive LaTeX Symbol List, LaTeX Command Summary, and TeX Reference Card. Basic LaTeX Commands has a nice brief introduction to some of the most important LaTeX commands. One of the best ways to quickly learn LaTeX commands is to apply styling and structure via the graphical TeXstudio tool. The tool has icons for bold, italics, basic math operations, miscellaneous symbols, etc. The next screen snapshot shows an edited file in TeXstudio in which I almost randomly applied LaTeX commands entirely via TeXstudio. The screen snapshot after that shows the PDF generated with pdflatex.exe. The most difficult aspect of learning LaTeX is dealing with so many options. The numerous options for LaTeX implementations/distributions can make it a bit overwhelming deciding which to download and use. Once that obstacle has been overcome, the large number of commands that LaTeX supports can be a bit daunting. Fortunately, I found that I have been able to start apply LaTeX by following the steps outlined in this blog post. TeX - LaTeX Stack Exchange - "Question and answer site for users of TeX, LaTeX, ConTeXt, and related typesetting systems"
Good examples of the usefulness of the JDK 8 API documentation are in the familiar String class documentation. That class features two new overloaded static methods, join(CharSequence, CharSequence...) and join(CharSequence delimiter, Iterable elements). The Javadoc comments for these two new methods not only explain the methods' behaviors, but illustrate them with code that demonstrates the methods in use. This is similar to the Javadoc comment I've always found helpful on the String.substring(int, int) method. Code examples are used liberally in other new (to JDK 8) classes' Javadoc documentation as well, especially in the java.util.streams package. The class-level Javadoc documentation for the java.util.stream.Collectors class provides code examples of 7 potential uses for Collectors such as accumulation and grouping. The Stream interface provides an example of useful JDK 8 documentation on an interface. The text detail on applying the Stream interface is accompanied by a simple code example that demonstrates "an aggregate operation using Stream and IntStream." The java.util.stream package itself has great description text regarding Streams that includes a simple example of employing a Stream with a detailed discussion of what is going on with that example. The package documentation for java.util.stream goes onto discuss several different aspects of using Streams such as stream operations and pipelines, parallelism, side effects, and reduction. Just as it is important to understand Streams when working with JDK 8 lambda expressions, it is also useful to understand functional interfaces when using lambda expressions and the java.util.function package-level description provides a nice overview. Most of the JDK 8 Javadoc-based documentation I've discussed so far provides code examples demonstrating use of the described package, class, or interface. Some of the new JDK API documentation uses code to demonstrate the new API feature by showing code that formerly would have needed to be written but is replaced by the new feature. Good examples of this exist in the well-known Java Map interface. The Java Map interface has several new methods specified in JDK 8 and many of these new JDK 8 methods include Javadoc documentation indicating code that would have been required prior to JDK 8 to accomplish the same thing as the newly added method. 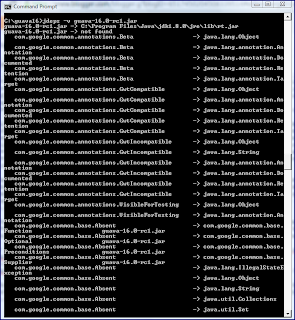 For example, the methods computeIfAbsent, computeIfPresent, forEach, getOrDefault, and putIfAbsent methods all have comments providing code demonstrating what the "default implementation is equivalent to." Although this may be explaining the default behavior of Map implementations, it is also useful for understanding the type of pre-JDK 8 code these methods emulate or replace. JDK 8 introduces a completely new Date/Time API and the java.time package has a nice package-level overview of the API. Constructs in this entirely new package have individual level comments that are useful for learning this API. Examples include Clock, Instant, LocalDateTime, Period, and ZonedDateTime. The package-level documentation helps clarify the relationship between LocalDate, LocalDateTime, LocalTime, ZonedDateTime, and Instant. JDK 8 Javadoc isn't only changed for the standard JDK API. JDK 8 brings some enhancements to the javadoc tool that will impact developers' own Javadoc comments and code. It is also important to be aware of the -Xdoclint:none option (mentioned in Stephen Colebourne's blog post Turning off doclint in JDK 8 Javadoc) for preventing Javadoc that doesn't conform to "W3C HTML 4.01 HTML" from breaking. The final bullet on the Enhancements in Javadoc, Java SE 8 page states that this Javadoc HTML conformance compliance "feature is also available in javac, although it is not enabled by default there." That same bullet tells us that we can learn more about the -Xdoclint:none flag by running javadoc -X.
I sometimes hear that there is never a need for comments when the code speaks for itself. I believe that is true to a degree, but the presence of useful Javadoc comments on packages, classes, and interfaces and their methods that were introduced with JDK 8 will make the adoption of JDK 8 much quicker than reading everyone of these constructs' code listings would. It reinforces my opinion that we often don't need comments on specific lines of code that do something, but most often do need comments on interfaces and contracts. In my ideal world, the code would be so well written that the only necessary comments would be Javadoc style comments (/** */) and we'd need very few // or /* */ style comments. JDK 8 continues a trend that has occurred in recent major revisions of the JDK of improved Javadoc comments in terms of readability and understandability. Mark Reinhold's post JDK 8: General Availability announced the general availability of JDK 8 this past week. In this post I look at some of the plethora of posts and articles on JDK 8. The JDK 8 Release Notes include links to many resources including to the post What's New in JDK 8 that outlines the new features of JDK 8. Other referenced pages include JDK 8 Adoption Guide, Java Platform, Standard Edition 8 Names and Versions, Known Issues for JDK 8, and the Java Platform Standard Edition 8 Documentation. There are numerous other posts announcing JDK 8 availability. These include Java 8 officially arrives at last, Java 8 is going live today - here's your crib sheet, 8 new features for Java 8, Java SE 8 is Now Available, David Thompson's Six Important New Features in Java 8 (JDK 8), Lucy Carey's Java 8 is the biggest change to the syntax of the JVM since generics in Java 5, 5 Features In Java 8 That WILL Change How You Code, Happy 8th Birthday Java!, Java Developers Readiness to Get Started with Java 8 Release, Benjamin Winterberg's Java 8 Tutorial, and Pierre-Hugues Charbonneau's Java 8 is Now Released! I've also previously referenced the useful Baeldung Java 8 page and the Java 8 Friday series of posts has useful details on Java 8. The most commonly discussed Java IDEs (NetBeans, Eclipse, and IntelliJ IDEA) are providing support for JDK 8. NetBeans 8 was released in conjunction with JDK 8 and includes JDK 8 support. Daniel Megert announced "[Eclipse] Luna (4.4) builds contain the Eclipse support for JavaTM 8" and that support for Eclipse Kepler is available with a feature patch. IDEA 13.1 was released with JDK 8 support. Lambda expressions are arguably the most anticipated and biggest feature of JDK 8. Oracle has provided a Java SE 8: Lambda Quick Start. Other useful resources on JDK 8 lambda expressions include Java Lambda Expressions Basics, Java programming with lambda expressions, and Stephen Chin's Java 8 Released! — Lambdas Tutorial. A welcome new feature of JDK 8 is the Joda-inspired Date/Time API. Introductions to the new Java Date/Time API include Oracle's Java Date-Time Packages Tech Notes, Fabian Becker's A new Date and Time API for JDK 8, and Java Time API Now In Java 8. Michael Scharhag demonstrates StringJoiner in Java can finally join strings. Default methods are the subject of Ryan Kenney's Java 8 Default Methods and Multiple Inheritance. Java Mission Control 5.3 is also included with Oracle's JDK 8 (as it has been with JDK 7 since update 40). Other new features in JDK 8 include Calendar.Builder and the jdeps static dependency analysis tool. We also recently learned that JDK 8 will use TLS 1.2 as default. The arrival of JDK 8 brings much to be excited about. Streams and lambda expressions rightfully dominate the discussion, but many other features of JDK 8 are sure to make Java quicker and easier to use. 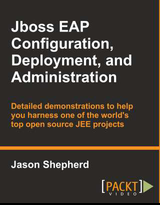 There is a lot to learn in JDK 8, but fortunately there are numerous freely available online resources to aid this effort. I've tried to summarize a small sample of those resources here. 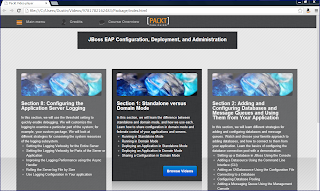 jQuery UI Development consists of six sections viewable in the same browser-based Packt Video Player as the video courses I have previously reviewed (JBoss EAP Configuration, Deployment, and Administration and HTML5 Game Development). As was the case with those video courses, jQuery UI Development is divided into separate and videos ranging from roughly 1 minute long to 8 minutes long. 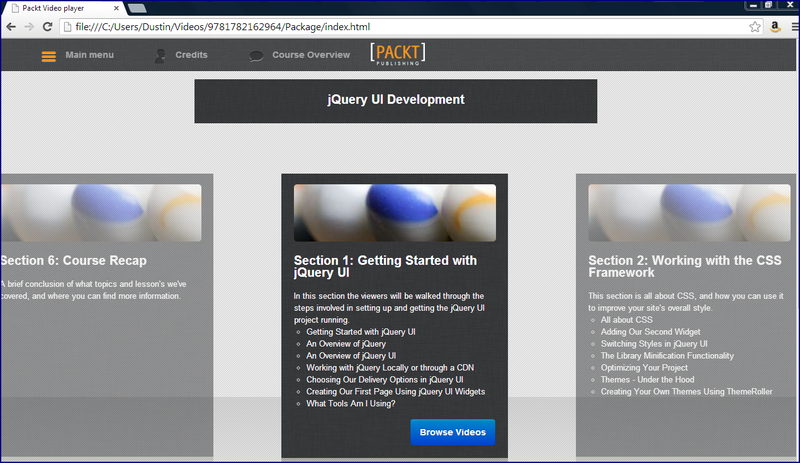 The first section of the video course jQuery UI Development is very introductory. The first video of this section introduces the video course and the next two videos introduce jQuery and jQuery UI at high levels based on a review of their current main web pages. Fhala explains why jQuery is so popular for web development and how jQueryUI supplements core jQuery. His video shows current content on the main jQuery and jQuery UI pages and he adds explanation and personal opinions to what is stated on those pages. The fourth and fifth videos in Section 1 briefly describe the two methods for acquiring jQuery and jQuery UI: downloading them ("local download") at http://jquery.com/download/ and http://jqueryui.com/download/ respectively or referencing them in Content Delivery/Distribution Networks (CDN). The author/narrator specifically describes accessing jQuery and jQuery UI from the Google CDN (jQuery/jQuery UI) and from the Microsoft Ajax CDN (jQuery/jQuery UI). He outlines advantages and disadvantages of using CDNs in each case (jQuery and jQuery UI) and briefly summarizes tactics for developing against downloaded versions and deploying against CDN versions. He also discusses and demonstrates how to reference these CDN-hosted libraries from HTML pages. The narrator references his site http://02geek.com/ to show an example of converting HTML links to buttons. An interesting side note is that there is also a jQuery CDN. The final video of the first section covers the tools the narrator is using for the video course. He uses MacOS, Safari web browser, and Sublime Text editor, but he also points out that a viewer could use any tools that he or she is comfortable with rather than these tools. He also shows how one can configure Safari's Developer Tools to be enabled and how to view source in Safari. 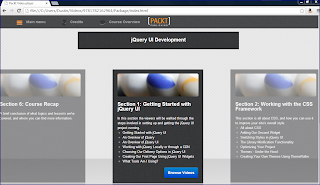 The second section of jQuery UI Development focuses on Cascading Style Sheets (CSS) support. It starts with videos demonstrating how to add an HTML input field, easily convert that field to a jQuery UI datepicker, and then how to easily change the jQuery UI theme via change of specified theme folder. The fourth video in Section 2 demonstrates how to only download pieces of jQuery UI that an application needs using Download Builder and the fifth video demonstrates applying these "minified" code dependencies to an application. The sixth and seventh videos of Section 2 delve deeper into jQuery CSS support by looking at the overall file hierarchy of CSS support files and introducing the impressive ThemeRoller that allows one to dynamically create jQueryUI themes with no knowledge of CSS and without any CSS skills (style and taste are the only limiting factors). The third section focuses on "Widgets" components. It is the longest section of the video series (the second longest section, Section 5, is also the second session on "Widgets"). The narrator begins by demonstrating creation and manipulation of a simple jQuery UI Dialog. As part of this, he demonstrates Download Builder's really useful feature of associating selected components with components they depend upon so that all dependencies are automatically selected with any components that depend upon them. Options, methods, and events for widgets are explained in this section. They are introduced collectively in a video as the jQuery UI API documentation for Dialog is shown and then each of them is featured in its own video. Widget events are covered as callbacks in this third section. The focus of the fourth section is on using Events to add interaction to an application. Fhala uses console.log to show some of the internal workings of Events and to figure out what options, methods, and events a particular widget supports. Fhala explains why a standalone Event might be preferable over a simple inline callback (more than one widget can use the same named standalone Event) and discusses practices to make these more generally useful. He makes several mistakes during the demonstration and does some on-the-fly debugging and resolves those typos and mistakes. These don't add much overall time to the length of the section, but I think they add a realistic view of what anyone who does real application development experiences every day. The final section is a single, short video. It's not really so much a recap as it is a reference to the author's contact information and finding other work of the author on Packt Publishing's site. One thing that is quite different about this video course as compared to the HTML5 Game Development and JBoss EAP Configuration, Deployment, and Administration video courses is that this course features video of the speaker himself throughout whereas the speaker is never visible in the other courses. I was a bit concerned at first when the video of him speaking seemed to take up too much real estate on the screen, but was relieved to see that he minimized the video of him speaking and moved it into the lower corner when it was important to show documentation, code, or application demonstration on the screen. Fhala states the versions of jQuery (1.9) and jQueryUI (1.10.1) covered in this video course. I appreciate this because with rapidly changing technologies, it is important to know to which versions the teaching material applies. Fhala states that he chose jQuery 1.9 rather than jQuery 2 to allow support for older versions of Microsoft Internet Explorer (IE 6, IE 7, and IE 8). Fhala heavily references the jQuery documentation and especially the jQuery UI documentation. This documentation is pretty impressive, thorough, and approachable, but Fhala's presentation makes it even more approachable and easier to understand. He mixes emphasis on text in the documentation with his verbal commentary and illustrations of the documentation principles in practice via coding and running the examples. Although most of the material covered in this video course is readily available online, the video presentation smooths out the initial learning curve and allows the viewer in roughly 2 hours to be very comfortable with the overall concept and use of jQuery UI and how to effectively use the jQuery UI documentation. It feels like Fhala did plan out the overall presentation and topics of this video course ahead of time, but that many of the low-level specifics of the presentation were not as practiced, scripted, or rehearsed as the overall concept was. Although this could be seen as less polished, I did not mind it and thought it provided a more realistic view of how a developer would use and apply jQuery UI documentation and jQuery UI in coding. The fact that some real typos and other mistakes were made did not take a lot of extra time to fix and provided a realistic view of how a developer works with any language or framework including jQuery UI. It is useful to see what types of errors occur rather than always seeing the polished "happy path." The video is clear and easy to view (should be viewed in full screen mode when watching code examples). The audio is generally good, though once or twice the narrator's voice seems to trail off a bit and there were occasional mistakes in the verbal descriptions that were generally quickly remedied. Besides video of code editing in Sublime Text, video of running and debugging the simple applications in Safari, and video of the author speaking, the videos in this course occasionally include other minor effects that add some liveliness and emphasis to the presentation. Other online reviews of jQuery UI Development video course are available at Video Course Review: jQuery UI Development and O'Reilly reviews. 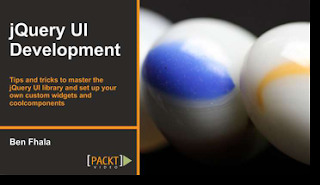 The Packt Publishing site for this video course features numerous screen snapshots of the video course under the heading "Screenshots from the course." Some of these provide representative samples of how the video is laid out for examples and for featuring the narrator speaking. The Packt Publishing site for this video course also features a sample video clip. I highly recommend viewing this clip to determine if this approach to learning jQuery UI suits you. Most of the sections in this video course featured an initial video that provided a high-level overview of what was to come in that section. As stated in the previous bullet, Fhala does an excellent job providing an introductory jQuery UI video course. It is important to note that the emphasis is introductory and that developers with moderate to significant jQuery UI experience are likely to get less out of the video course. It seems targeted at people with little or no jQuery UI experience.